Cable companies hate Netflix. They pretend it’s because the streaming video service puts up a fuss about having to pay a toll just to be carried that last mile of the Internet to customers’ homes. But really, as new data shows, it’s because people are now spending an awful lot of time watching Netflix instead of watching TV. GigaOm reports on new data from The Diffusion Group, which estimates that the average Netflix subscriber spends 46.6 hours each month watching videos on the service. In a 30-day month, that comes out to 93 minutes each day. 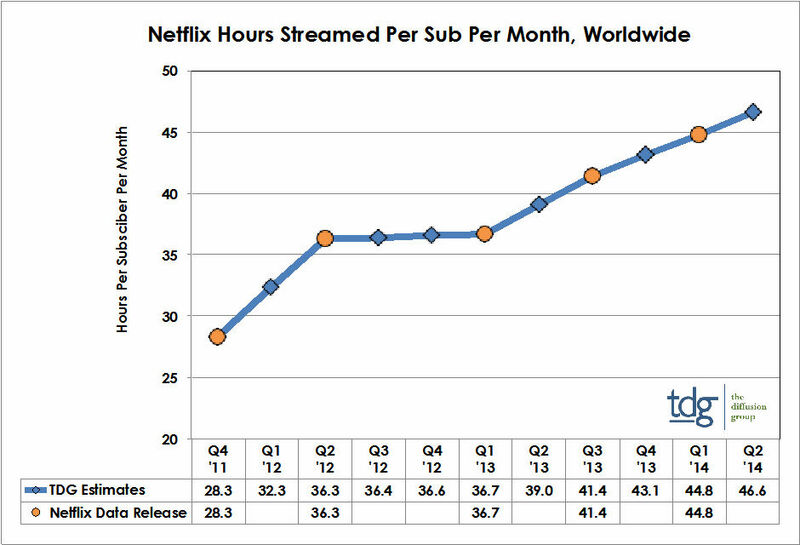 The TDG figure is based on an estimate, but even Netflix’s most recent official numbers put the monthly average at 44.8 hours/month (89.6 minutes/day). Not even three years ago, Netflix users were averaging less than an hour a day streaming video. But with people becoming increasingly tired with traditional TV, with its commercials and week-long waits between episodes, they have apparently been turning to ad-free streaming services where they can binge watch all of Lost before realizing they should have stopped after season 3, or that The Killing gets much better after its first season. Meanwhile, cable companies and broadcasters have begun to make more content available via their own on-demand and online platforms in an effort to placate binge-watchers. To us, the increased use of Netflix shows the real reason that Verizon, Comcast, and others allowed Netflix streams to bottleneck and slow down until the company paid for better access. These cable companies, which do little more than hand over data that Netflix’s bandwidth carriers bring to their doorstep, were watching the growing popularity of the service and seeing their own doom in those downstream numbers, even though the mere existence of Netflix is a reason that many consumers even have higher-speed broadband to begin with. The cable companies’ cries that Netflix was such a drain on their systems is also called into question when one considers the amount of data that is actually being used. Sure, 90 minutes a day of Netflix seems like a lot, but when you figure an average speed of 2.57 mbps, that means that an hour of Netflix viewing comes out to about 1GB of data used. So over the course of a month, you’re talking about fewer than 50GB of data consumed. Given that most cable companies have monthly data caps — if they have them at all — of around 250GB, this means that even this newer level of heavy use still only accounts for about 20% of one’s allotment. If a cable company is going to sell broadband service and tell customers they can get downstream speeds of 10Gbps and have data caps north of 250GB for the month, they should be doing what it takes to deliver those; not demanding a toll from the companies that make it worthwhile for customers to even pay for service in the first place.